Memories is the name of my favorite Doc Watson album. I just about wore the needle through the 2-record LP that included Make Me Down A Pallet On Your Floor, Shady Grove and Miss The Mississippi when I became a fan of Doc’s in the 1970s. I first saw him in concert then and witnessed his talent and showmanship first hand. Then a few years later, when I interviewed him, I found him to be every bit of the gentleman that I had anticipated. When Doc came to perform at the Ryman Auditorium in 2011, I was just as excited as I had been when I was an 18-year old guitar player in 1975. As what turned out to be his last Ryman show approached, I recalled these memories in a dispatch called Doc Watson – No Strings Attached. I hope you’ll enjoy these memories of Doc. Doc Watson is my favorite acoustic guitar player. He is a hero to me for the amount of talent he has in his voice and hands, and for the way he conducts himself on stage. Always with dignity, humor and enough integrity to weigh down a jumbo Gallagher guitar case. When tickets became available for his Ryman Auditorium show July 28, 2011, I jumped at the chance and ordered immediately. the popular song The Battle of New Orleans. The boys and I were “just eat up” with learning and playing as much acoustic music as possible. Doc was high on our list of people to emulate. 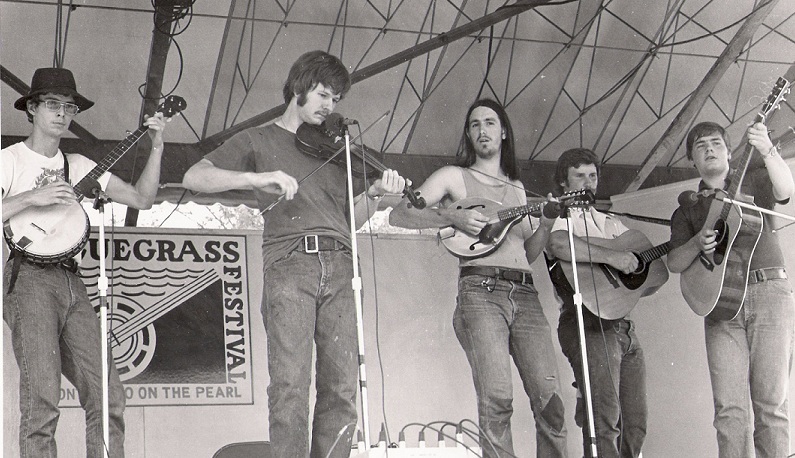 The summer after my freshman year at Ole Miss, a wondrous announcement was made: The Atwood Bluegrass Festival in Monticello, Mississippi would bring Lester Flatt & The Nashville Grass and Doc Watson to perform. The Eighth of January developed a plan of action in short order. Our fiddler Steve Cook of Clinton and banjo player S. Cragin Knox of Jackson would drive south, while I would mount the Southern Campaign and head north from Pascagoula to converge on this monumental event in force. Jamming at bluegrass festivals brings pickers together for the length of a song and sometimes for much longer. The day of Doc Watson’s performance, Knox, Steve and I made the acquaintance of Carl Nobles, a guitar player from Hazlehurst. He sat in with us and we’ve all been friends ever since. A long-haired mandolin player from Vicksburg also played with us that day and I haven’t seen him since. While we were jamming, John Stennis, Jr., then a state legislator, walked by and asked if we wanted to play on the big stage. It took us less than a claw hammer banjo lick to say “yes!” Because we were unscheduled, we were the last local band to perform before the stage was cleared and set for Doc. For several years afterwards, I bragged about “opening” for Doc Watson in Monticello. Five years later I saw Doc again at the Sand Hills Bluegrass Festival in Marianna, Florida. I had earned a degree and was a young radio station news director in Mobile, Alabama. When I heard that Doc would be that close to Mobile, I made plans to attend. Because of my job, I would get to participate in a “sit down” with Doc Watson and the local media, some of whom also played guitar. Talk about another dream come true! Doc was as gentlemanly and forthright as we could have imagined. “You’d be surprised at how little I pick at home,” he said when we guitar-playing newsmen asked how often he practiced. Since then, I’ve seen Doc perform at many times at places like the Station Inn and the Ryman Auditorium and each time, as a picker and as a person, I have felt honored to be in his presence. This entry was posted in Uncategorized and tagged acoustic, bluegrass, clawhammer, Doc Watson, Florida, Gallagher, guitar, Les Kerr, Lester Flatt, Marty Stuart, Mississippi, Mobile, Ryman, Tennessee. Bookmark the permalink. I really enjoyed this post! I could sense your excitement as a youngster going to see one of your musical heroes! I had not heard Doc Watson, but looked him up on YouTube. He was an awesome picker. I love the pics of your band too.